Today we take a day trip by van to Joshua Tree National Park to explore the Park's confines by bicycle on a point-to-point ride. Beginning in the community of Joshua Tree you'll pedal through the west entrance and tackle a series of gentle rollers as you ascend to Arch Rock. Soak up the magnificent views of the Yucca Valley and expanses of joshua trees dotting the desert floor while savoring a guide-prepared picnic before descending into Pinto Basin. Bighorn Riders may continue to the Cottonwood Visitor Center at the park's southern end, where we'll return by van to the Miramonte Resort. Relax, soak the legs in the pool, and then it's time to gather for our dinner. After our two-nights stay in Indian Wells, we head south underneath the tall date palms of the Coachella Valley through the countryside to the Salton Sea. From here, we head west through the badlands of the Anza-Borrego Desert to Borrego Springs, an oasis of a town surrounded by desert and ringed on three sides by high mountains. Base camp for the next three nights is at La Casa Del Zorro, a golf and tennis resort nestled between the Anza-Borrego Desert and the foothills of the Santa Rosa Mountains. The resort boasts a variety of recreational amenities, fine dining and comfortable accommodations. Dinner is once again near the hotel. Today we set out to explore the Anza-Borrego Desert by bike. A nice warm-up this morning courses along the desert floor and takes in an impressive display of creative metal sculptures. Arriving at the Anza-Borrego State Park, you can take a nice hike and stroll the visitor center. An optional rest day, perhaps you're more inclined to partake in the diverse resort amenities and spend a day off the wheels. Discover the small community of Borrego Springs, visit the desert gardens at the Borrego Art Institute. Of course, we can accommodate those riders looking to log miles with another Bighorn Ride. You'll be free to dine independently this evening. Evoking the sense of a grand estate, an expansive village of Tuscan tiled villas with grand archways and fine-crafted stonework are woven into 11 acres of lush citrus, rose and herb gardens. A luxury resort nestled between the Anza-Borrego Desert and the foothills of the Santa Rosa Mountains. The Resort boasts a full service spa, fine dining and comfortable accommodations. Take a moment to consider the ingredients necessary for the perfect Winter bicycle tour. At the top of the list is a climate with typically dry weather and a break from the harsh cold season found elsewhere in‍ ‍‍much of North America. Next, the roads have to be great for cycling. And to make it a hassle-free vacation, the location needs to have relatively easy access. We’ve turned the pedals over all across the US and have spent a few seasons in search of that Eureka! moment. And we’re here to tell you, we've found it in our Mojave Desert Bike Tour. 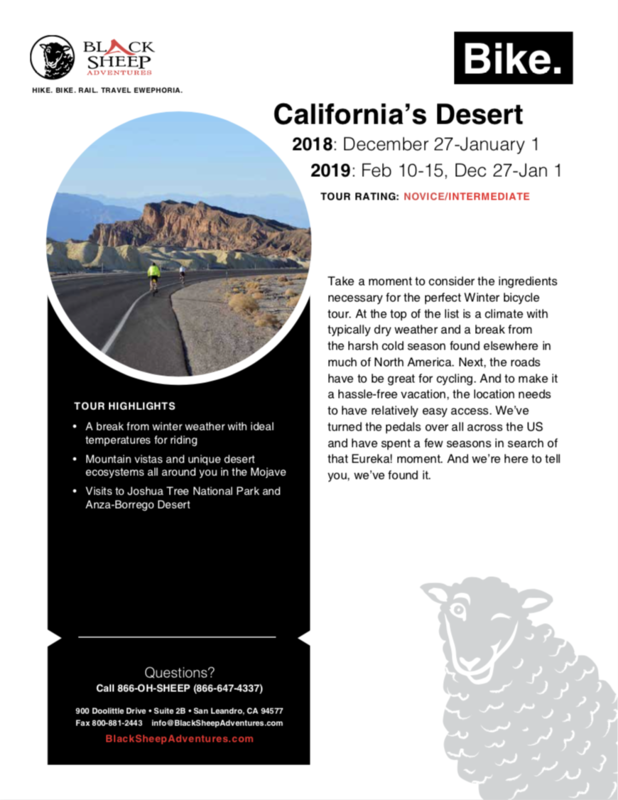 Come ride with us through Joshua Tree National Park, Borrego Springs, Yaqui Pass, and more!